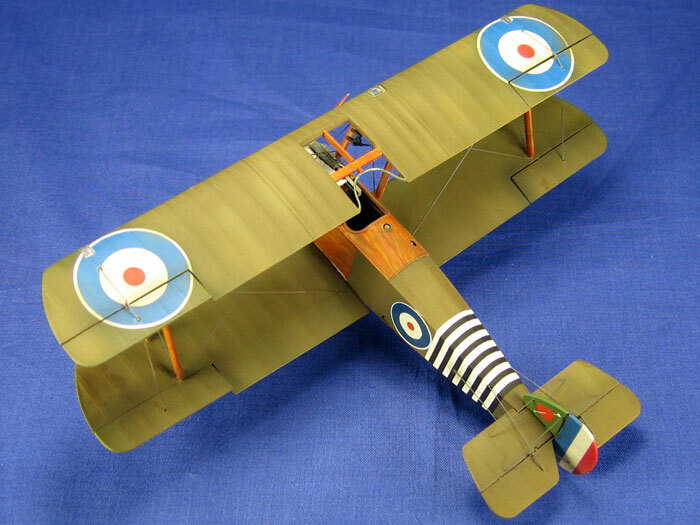 Having destroyed more enemy aircraft than any other fighter of World War 1, the Sopwith Camel was one of the most successful designs of the war. 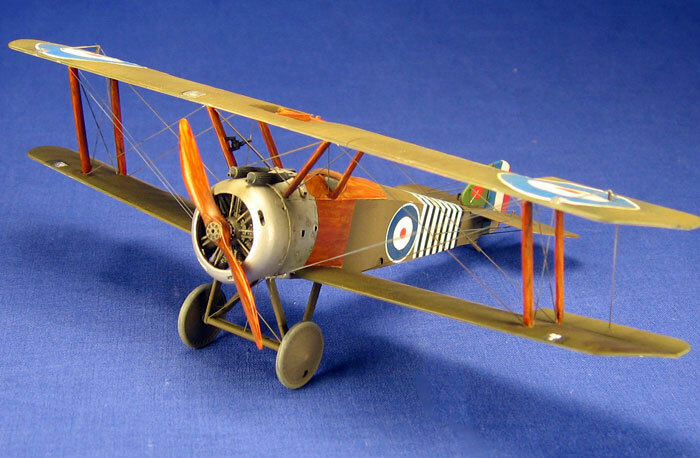 Entering service during the spring of 1917, it was a highly maneuverable yet difficult aircraft to fly. With the engine, fuel tanks, and guns up front it was very nose heavy, and that combined with the action of the rotary Clerget engine gave it a fantastic right-turn capability. Veteran pilots would use this to their advantage, but a number of inexperienced pilots were killed in accidents as well. 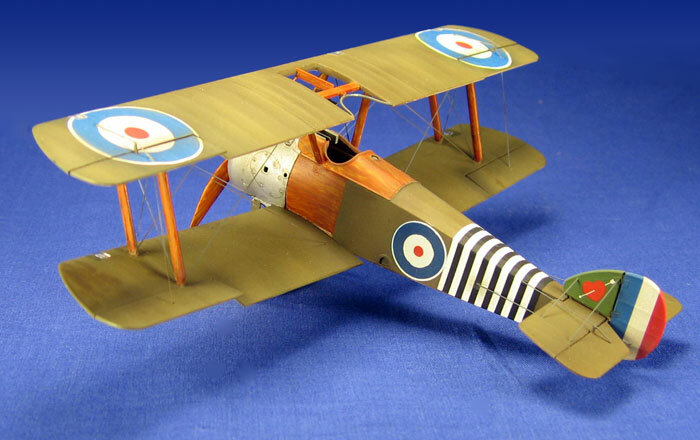 Eduard’s new Camel kits have been out for a couple of years now, and I decided to build one of them depicting Camel #B6313, the Camel used by the famous Canadian ace William “Billy” Barker for 46 of his kills. Construction of the cockpit, fuselage, and lower wings went smoothly, but attaching the upper wing and struts was one of the most frustrating exercises of my modeling life! The upper wing sits forward of the lower wing, meaning its struts, all eight of them, all sit at various angles. While I love Eduard’s kits, I thought the kit engineering here was poor. All of the struts are molded with small nubs on the ends that are supposed to fit into equally small recesses in the lower and upper wings. The nubs aren’t long enough to hold the weight of the strut however, meaning there’s no way to glue a strut to the wing without having to hold it with your hands while it dries. Since the upper wing needs four of the struts in place to hold its weight, you end up trying to glue four struts to the lower wing and then hold them all upright while trying to position the upper wing on to them! Unless you are an octopus, you quickly run out of hands. It didn’t matter what glue I used, I just never had enough hands to hold it all together. I tried a homemade jig, but that didn’t work either. After a whole night of trying different methods and failing, I was ready to pitch the whole kit in the trash! Finally I had success by super-gluing the inboard struts onto the fuselage at what I thought were the right angles, and then super-gluing the upper wing to them. The four outboard struts were then attached after that, but as I expected, the whole assembly wasn’t as accurate as I would have liked. The upper wing is too far forward and off to one side a bit, but there was no way I was going to go back and try again! It was truly a frustrating experience. I think Eduard could easily fix the problem by turning the nubs on the ends of the struts into proper pins that could hold the struts up on their own. 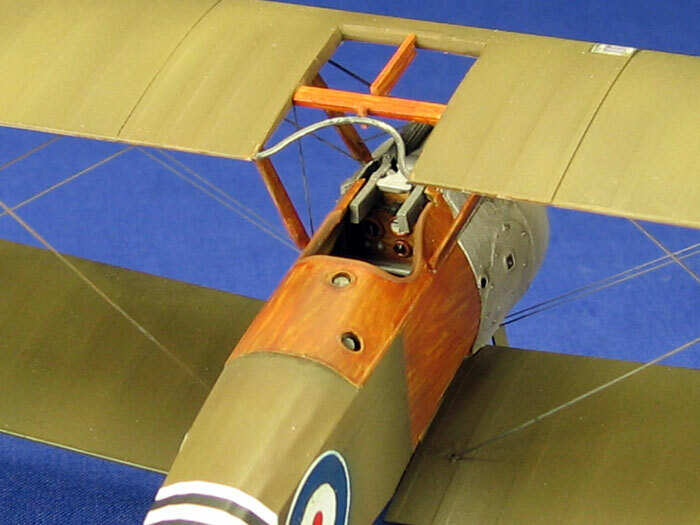 The modeler could then easily drill holes in the wings, assemble the struts, glue them and the upper wing, and then position the upper wing accurately as the whole assembly dried. I’d gladly putty over some small holes to avoid that experience again. Once my upper wing rage subsided I finished up the construction, adding the cowling and landing gear. I used EZ line for the rigging. I left off the wheels, prop, and machine guns and the model was thankfully ready to be painted. After a primer coat of Mr. Surfacer 1000 was sprayed on the whole aircraft, I sprayed Testors Acrylic Radome Tan on the undersides of the fuselage and both wings to simulate Clear Doped Linen. To simulate the khaki green color on the upper surfaces I used Tamiya Olive Drab. I then added some Tamiya Dark Yellow to the Olive Drab to tone it down a bit, and randomly sprayed some spots and streaks on to the upper surfaces. I brush-painted all of the Camel’s wood parts using a three-step procedure that I read about online. First the parts were painted Testors Acrylic Wood, a beige color. Then Testors Acrylic Leather and a small brush were used to paint wavy lines to simulate the grain of the wood. Lastly a generous coat of Tamiya Clear Orange was used to unify the first two steps, resulting in realistic looking wood with a varnished gloss finish. The cowling and sheet metal panels around the nose were brush-painted with Testors Aluminum. The machine gun was painted Tamiya NATO Black and then dry-brushed with Testors Steel. The rigging wires were painted Tamiya NATO Black. I sprayed the entire model with Future to get it ready for the decals. 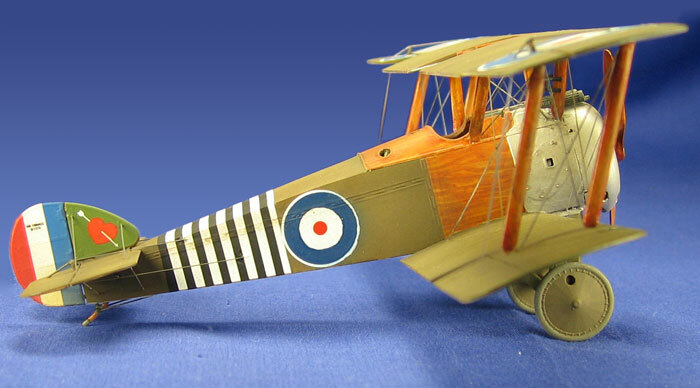 I used Eagle Strike’s “Sopwith F.1 Camels, Part 1” decals and they went on flawlessly. I usually use Walthers Solvaset to get the decals to sit down over any bumps or recesses, and the Eagle Strike decals had no problems with it. I glued on the prop, wheels, and machine gun and sprayed some Testors Enamel Flat Finish over the whole aircraft to seal the decals and tone down the finish. Like many modelers I’ve tried many flat finishes in search of the one that creates the flattest finish and lately I’ve had very good results with the Testor's Enamel Flat, sprayed right out of the bottle with no thinning. Using a small brush I used a thin wash of 50/50 Lamp Black/Raw Umber to accentuate the recessed lines around the cowling and sheet metal panels on the Camel's nose. I then airbrushed a very then mix of the same mix around the flaps, wheels, where the wings and stabilizers meet the fuselage, and especially around the engine and cowling to add a bit more grime to the model. My last step was to mist on a bit of Tamiya Desert Yellow around the wheels and rear skid to simulate some dust and dirt.